The Fairmont Sonoma Mission Inn & Spa is an elegant oasis, blessed by natural mineral hot springs in the Sonoma Valley. An idyllic, world famous wine growing region abundant with local products, the hotels signature restaurant Santé is designed to exude the California Wine Country Spa experience. The Fairmont Sonoma Mission Inn & Spa offers a wonderful retreat with rooms to suit every taste. Accommodations range from recently restored Fairmont Heritage rooms to signature suites. You will find beautifully appointed rooms, many with fireplaces to set the mood at the end of a perfect day touring the local wineries or enjoying the spa. All rooms feature telephones with voice mail, a selection of Fairmont Sonoma Mission Inn & Spa bathroom amenities, mini-bar refrigerator, terry cloth robes, and air-conditioning. The Fairmont Sonoma Mission Inn & Spa features a variety of fine dining, from Santé Restaurant, with its international reputation for the finest in cuisine, with its 50-year history of serving wonderful food in a casual atmosphere. The hotel is blessed to be located in a region where fresh produce and exceptional products are in abundance for use to be paired with some of the finest wines in the world. The chefs are continuously at work developing innovative dishes for guests to experience. 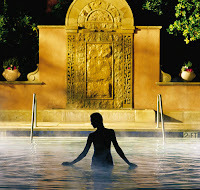 The Fairmont Sonoma Mission Inn & Spa is one of the most comprehensive full service spas in Northern California. The Fairmont Sonoma Mission Inn & Spa is proud to be one of the only luxury spa resorts in the country with their own source of thermal mineral water, which flows from 1,100 feet directly beneath the Inn at 135 degrees. The Spa pays homage to ancient Egyptian, Greek and Roman civilizations, who believed in the axiom, 'Sanitas Per Aquas', or healing through water.